After that whole thing about him winning a Red Smith Award that he probably shouldn't have won, Albom's stayed out of the spotlight. Or, wait, no: He's written a play and developed a TNT show. And, somewhere along the way, he found time to visit the Apple Store and write about it. 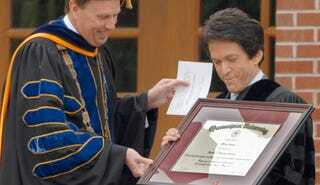 Hey, kids — Mitch Albom has some advice for you! And here it is! They say there are nine planets in the solar system. But that is not true. There is a 10th. On this planet, no one has a job or anyplace to go. They simply drift all day in an endless swirl of new products, most of them white. You need no food, no water. You can stay there for years with your mouth hanging open. One such Genius signed me in (on a handheld device, which I'm sure took my vital signs and spat out my SAT scores) and another summoned me to the Genius Bar, where the Geniuses presumably pour each other blue drinks like those "Star Wars" creatures, and where a redheaded female Genius with the tattoo of a something crawling up her arm looked me in the eye, smiled sweetly and said, "You pathetic imbecile." She didn't say those words. That's just how I felt. Actually, once I told her what the problem was, she nodded pleasantly, gave a brief explanation of several possibilities and told me, "Don't worry." I felt like a man whose doctor looks at a troublesome X ray and says, "It's nothing." I wanted to kiss her sneakers. Genius: "Do you back up your data?" Genius: "Do you have a Time Machine?" Genius: "You may need to bring it in." I did not realize a Time Machine was a device Apple sold for data storage. I just figured the Geniuses had mastered time travel and assumed the rest of us dummies dropped by from the 17th Century. "After we reload the Time Machine, we can add RAM, upgrade the graphics card, increase the memory, maybe click in a terabyte," she said. "Good, good, yeah, yeah," I said, nodding as if I had the slightest clue what she was talking about. A friend reminded me to be grateful because at least she lived in this country and wasn't talking to me over the phone. She then wrote me a prescription, told me to drink lots of fluids and had me make an appointment with the nurse on the way out. You keep doing you, metropolitan daily newspapers. Roll over, Red, again.